Researchers reported on a novel method this week at the 247th National Meeting of the American Chemical Society, to produce biodiesel from crude animal fats, including waste fat from alligators, using supercritical methanol in a flow reactor. The global market for specialty fuel additives is expected to reach $8.5 billion by 2020, according to a new report by Grand View Research. With biodiesel's growth, cold flow improvers are expected to be the fastest growing product segment. Diesel engines are responsible for moving the majority of goods, including electronics, from manufacturer to consumer. 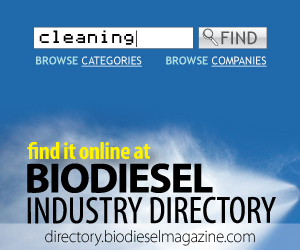 And more than ever before, biodiesel is playing a role. Rudolf Diesel's birthday, March 18, is also designated Nat'l Biodiesel Day. The Iowa Biodiesel Board has chosen Grant Kimberley, ISA director of market development, as its new executive director to fill the vacancy left by Randy Olson, who took a position with the U.S. Soybean Export Council earlier this year. Germany's UFOP reports that biodiesel sales declined drastically by 90 million gallons in 2013, according to data from BAFA. 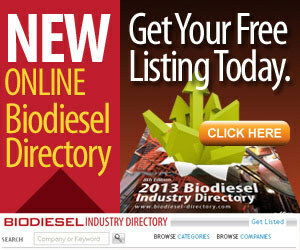 During 2009-'12, biodiesel sales averaged 750.5 million gallons. In 2013, the volume was only 660.5 million gallons. H.F. 2456 would establish a capital equipment loan program for renewable chemicals and advanced biofuel, creating incentive programs for advanced biofuel, renewable chemical and biomass production. Companion bill S.F. 2101 was also introduced. Before you lift that green beer on St. Patrick's Day, March 17, why not select one that comes from a "green" brewery? Many breweries throughout the U.S. and Canada have robust sustainability initiatives that include using biodiesel.